Hello. We are Hua, Mouri and Mo, Owners of Mathnasium of McKenzie Towne, your neighbourhood math-only learning centre. We help kids in grades 2 - 12 understand math by teaching the way that makes sense to them. We are currently Enrolling New Students and have some great promotions. I would definitely refer Mathnasium to the parents like me whether your kids are struggling or not in Math. My daughter been in this centre for 3 months, we’ve seen her a great improvement and confidence. The staff are awesome and have huge patience:), especially when my daughter is having trouble with their Math topics in school, staff are there to make sure she’ll understand and they will give her strategies which is I appreciate it so much. My daughter is always happy to go to their centre. Malay is doing much better at School in not only Math but also some of her other classes. I believe it is because her confidence is higher. Thank you so much. My son is really enjoying going to Mathnasium and is enjoying working with the instructors. He is already starting to build confidence in his math skills. 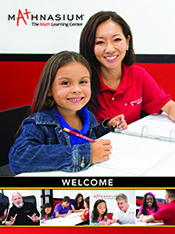 I have recommended Mathnasium to several people and will be bringing my older daughter for tutoring as well! We're really appreciative of the support our daughter is receiving. The follow up with her teacher has been excellent and she is gaining confidence. It has helped Mayla very, very much and she really loves being there. Mo and all the staff at Copperfield Mathnasium are professional, friendly and knowledgeable. They have been exceptional to deal with from my initial inquiry through to the tutoring sessions. I would highly recommend Copperfield Mathnasium to any family looking to enhance their child's math.